NATA collected nearly 2,000 postcards from athletic trainers demonstrating their support for S. Res 372, the Secondary School Student Athletes’ Bill of Rights, during the convention in Indianapolis, all of which will be distributed to their respective U.S. 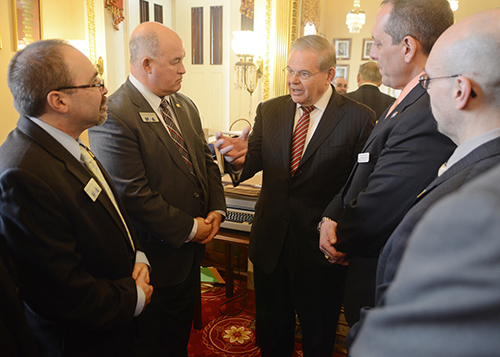 Senators by NATA’s lobbying team in Washington, D.C. If you didn't receive one of these postcards at convention or were unable to attend, don't feel left out: Email Jessica McDowell (jessicam@nata.org) to request extra postcards or to send those you may have collected since convention to the national office for distribution. Just remember to fill out both portions of the card, as they will be handed to both of your senators to demonstrate collective support for the resolution supporting the goals and ideals of the Secondary School Student Athletes' Bill of Rights. For more information on Senate Resolution 372, check out this fact sheet from NATA Director of Government Affairs Amy Callender. 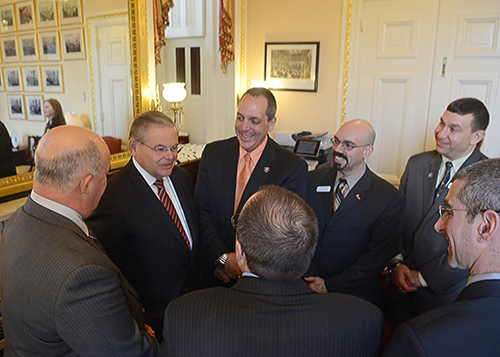 Top Photo: Sen. Robert Menendez of New Jersey (center), who introduced S. Res. 372 into the Senate in March, stands flanked by Eric Schwartz, MEd, ATC; District Two Director Michael Goldenberg, MS, ATC; NATA President Jim Thornton, MA, ATC, CES; Robb Rehberg, PhD, ATC, NREMT; John Furtado, MS, ATC; and Mike Prybicien, MA, ATC, CSCS.